On several occasions my Aspen MFD has been slow to reflect changes to the flight plan made in the IFD540. The delay has ranged from 30 seconds to in excess of 5 minutes. The CDI on the PFD seems to update the course immediately, shows correct deviations and correct received GPSS commands from the IFD540. In this situation I was direct ZESEP and given direct JIVLI. This pictures was taken several minutes after I was direct ZESEP. In this situation These waypoints are part of a GPS approach into O69 but this behavior as been observed when approaches are not involved. I talked to Aspen and they (of course) have never heard of the problem and suggest its IFD540 related. I never observed this with my GNS530. Additionally I have dual IFD540s set up to crosssync. I am wondering if anyone else has observed this and how to fix it! I don't have a lot of extensive experience flying with the 540 yet, but I did notice that phenomenon on my initial flights. The Apsen does not reflect changes to the flight plan very quickly at all. I'm wondering what that's about. The ASPEN unit does take maybe 15 seconds to update its on screen routing. I have not noticed a change in that behavior with the 540, did the same thing with the GNS unit it replaced. But I have never seen an exaggerated time, like minutes, for this. Fritz, now that is a Bonanza panel done right. Good on you to spend the extra on the Eaton switches, it totally modernizes your panel. Can I ask where you sourced those lighted pushbutton switches? The switches are Eaton switches and are fully configurable with one, two, three, & four segments, lighted in bright and dim, switchable via your panel lights, push button switch or just an indicator. They are awesome but cost about $400 each. I hope you get the Aspen / IFD 540 slow data update issue sorted out. Have you checked with the guys on BT? It's hard to understand why it should take so long. Although I do not yet have 540 flying experience (1-wk more in the shop), I see what you mean... is it possible you had not yet made the new Direct WP "Active" on the 540? BTW, beautiful panel layout - I am trying for a very similar look in my Comanche. That's a beautiful panel, and love the Eaton, but at $400 a pop, I think I will sell my Garmin stock and buy Eaton. I have not tried on BT yet, I assumed there may be a more informed answer here. To save you some searching, I can't think of any threads on BT that discuss this issue. I'm in the 15 second ball park in my test airplane equipped with the EFD1000 running latest Aspen software. Tell us what you see that's new? Sorry, I wasn't precise enough. My Aspen SW is 6+ months old. I don't know if there is some newer version out there. Just 2 days ago, flew 1 1/2 hour new 540 "maiden voyage", and also noticed dramatic time delay to display FP changes from 540 to Aspen MFD. I did not pay close enough attention to notice the PFD. Next flight will "Time" the delay from 540 change to both MFD + graphic /textual display on PFD. A little bit of followup. I recently updated the software on my Aspen units. Since the update this slow response has not reoccured. What version is your ASPEN firmware? Note, I did not double check the versions numbers, the above information is from my log book. I observed the phenomenon of slow updating of the flight plan display on the Aspen for the first time yesterday. It seemed to take about 5 minutes, but I did not time it. My Aspen software is 2.7.2 and the IFD is running 10.0.3. This is not a huge issue for me, as the IFD540 is mounted right next to the Aspen and serves as the primary moving map display. Nevertheless, I will be very interested if someone comes up with more information on the cause and/or a solution. I found the issue to be intermittent, but have not seen it after my latest software upgrade. I found it to be particular annoying when flying multiple, different, practice approaches. Having irrelevant waypoints scattered everywhere was a bit distracting. This issue has returned! I the picture below you can see the HSI is showing the correct information as is the moving map on the right. However, the magenta line on the HSI is not updated and the data block on the upper left of the HSI screen is still reflecting direct to the airport, not the approach procedure. I put the MFD into revision mode and it displayed the same (incorrect) information. This picture was taken several minutes after adding and activating the approach. Has anyone else had this occur? Any suggestions as to how to fix it? Note: this is a slight different occurrence as the moving may data has updated of the PFD, but not on the PFD side. 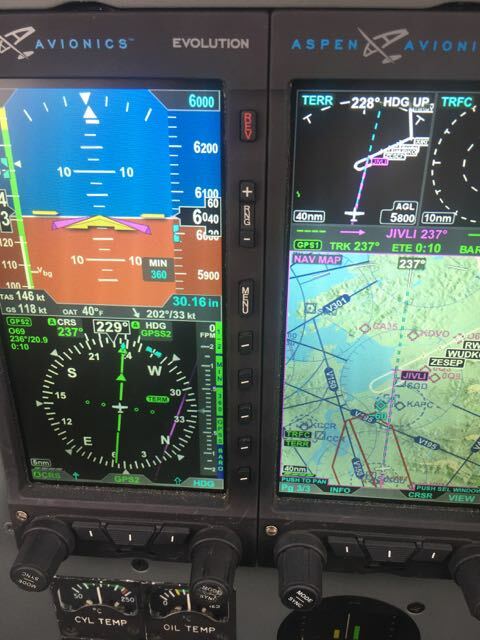 Any relationship to the MFD being on GPS1 and the PFD being on GPS2? No relationship. I actually tried both GPS1 and 2 on the PFD, they were both as pictured. For what it's worth, I have also observed that it sometimes takes a few minutes for the flight plan shown on my single tube Aspen display to accurately reflect a change in the flight plan in the IFD540. As expected, the HSI/CDI display responds correctly, but the underlying graphic continues to display the "old" flight plan for a period of time. Do you have an ACU, or an ACU2? This is entirely speculation, but the 429 protocol seems oriented towards very short messages - single facts like airspeed, altitude, location, actions. A long message like a flight plan would be inefficient, and lower priority than "the facts"; and consequently, might be spread out over time amongst all the important "facts" that need to be delivered. The ACU is limited to low-rate 429 (12k bits/second, or something like that iirc), whereas the ACU works at high rate 429 (8 times faster?). In my case, we took advantage of the Aspen IM rewrite to do a workaround of the ACU/ACU2 issue, by bypassing the ACU altogether. The 429 between the Aspen and the IFD is configured as Honeywell EFIS; don't know if that is high or low speed. I'm second-guessing myself anyway: The ACU speed would result in slow output from Aspen to IFD. The flight plan would go directly from the IFD to the EFD, so the ACU speed would not be a factor. I'll have to find my notes on the IFD to EFD configuration. Just as a datapoint, my system uses the ACU2 to manage communications between the Aspen and the IFD540. I checked the config on our plane this weekend. For the 429 signals from the IFD540 to the Aspens (both GPS and VLOC), they default to Low-Speed on both units, although the install manual provides for setting them to high-speed. They can be changed to high-speed (which is 8 times faster) by making the appropriate configuration changes on each device. We changed both the GPS out and the VLOC out to high-speed. This is possible because neither signal goes to the ACU. The Aspen 429 output, and the corresponding IFD input, need to remain at low speed if you use an ACU (vs an ACU2). Now, whether it speeds up the flight plan transfer - who knows? It certainly can't hurt. I have the same ACU-free configuration as you. Would you share with me the config changes you made please? I've got an ACU - it's just that the only 429 lines that need to be slow-speed are those which go directly to or from the ACU. That means the output on the Aspen needs to be low-speed, and therefore the IFD 429 inputs need to remain low-speed. So the Aspen install manual shows 429 Inputs 1 and 2 are assigned to the GPS1 and VLOC1. And Input 4 is assigned to the ACU+VLOC2. On the "NAV C" setup screen in the Aspen, set "Ports 1&2" to High speed. "Ports 3&4" need to remain Low speed for the ACU. Then on the IFD, you'll need to set the 429 OUTPUT assigned to the GPS to High - this is on the "Main ARINC 429 Config" screen. The format will be set to "GAMA 429 Graphics w/Int" The VLOC 429 output is on another screen well down in the stack: "VOR/LOC/GS ARINC 429 Config". "TX" can be set to high. The flight plan info is sent on the first one.